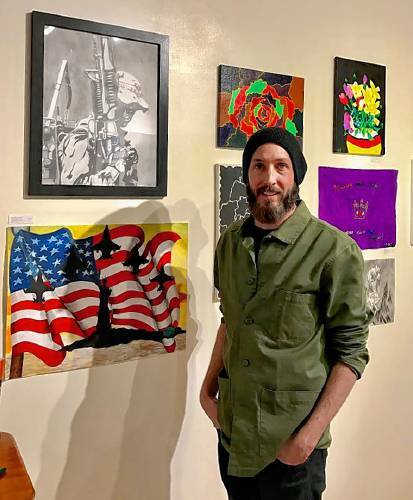 SHELBURNE FALLS — An unusual exhibit of artwork by U.S. military veterans is now on display through April 30 at the Salmon Falls Gallery. Some of it is unabashedly patriotic, some depicts the natural environment and some is definitely abstract — different perspectives by veterans living in western Massachusetts, who have all struggled with homelessness after coming home from war-torn regions. Having their artwork on display is a new experience for many of the artists in the Soldier On Veterans Community Arts Initiative. Soldier On is a nonprofit organization started in 1994 and dedicated to ending veterans’ homelessness. Based in Pittsfield and at the VA Hospital in Northampton, Soldier On provides transitional housing and support services to help veterans move from homelessness to home ownership. Veterans programs that help with this transition include: permanent and transitional housing, mental health services, substance abuse treatment, peer support, medical/dental treatment and employment and educational services. Hanford, a former dancer, became a fiber artist after an accident ended his dance career. His major art form is embroidered images on antique table linens, as his canvas. So far, about 120 veterans have participated in the arts program, with Hanford teaching an hour-long art class two days a week in Pittsfield and three days a week in Northampton. Hanford has a fine arts background, and honed his skills while living in New York City and in London. But if a veteran pursues an art form he’s not comfortable with, “there are plenty of people willing to help offer their talents,” he said. “I didn’t ever foresee having this career with vets in the arts,” said Hanford. But Hanford has found that more arts organizations are open to working with the program’s veterans. These include The Mount, the Norman Rockwell Museum, Shakespeare & Co., and Jacob’s Pillow. “People want to be a good neighbor to the veterans that we serve,” he said. “People really feel very strongly about veterans’ issues — homeless vets, in particular. Hanford said learning art skills and making art “starts building something greater than where they’re at.” Hanford said art gives the men and women another way to reflect on their experiences and their lives. Long-time students also help others as they gain more experience; when Hanford is unable to be at a class, the more experienced students will get out the art materials for the others. 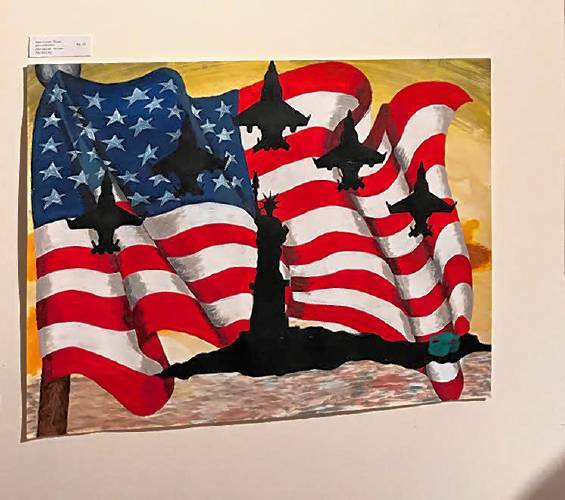 The veterans’ paintings on display at the Salmon Falls Gallery, 1 Ashfield St., are for sale, with the asking prices selected by the artists themselves. The gallery has donated the exhibition space and all proceeds from the sale of any artwork will go directly to the artists. Hanford also has an exhibit of his embroidered work, “Friendship Thread: Portraits of Friends both Near and Far,” with 20 percent of any sales from those works to benefit Soldier On. Winter hours for the gallery, through April, are Friday through Monday from 10 a.m. to 6 p.m.